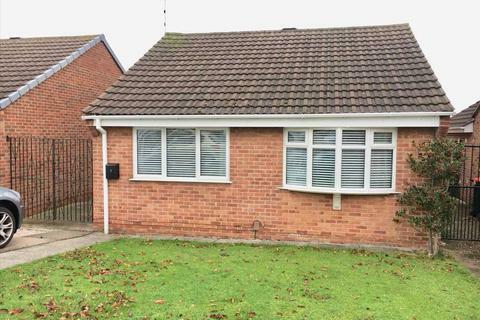 A low brick wall borders the tarmacadam driveway, which leads to the integral garage. A high wooden gate opens to a paved side pathway leading to the main entrance and rear garden beyond. Equipped with light and power, the garage is neatly finished with white painted walls and grey floor. There is also a wall mounted Baxi combi boiler. A brown up and over door opens to the driveway. A uPVC double glazed front door opens from the side pathway, granting access to the kitchen and the bungalow beyond. Lit by a matching double glazed window to the side, the kitchen is well equipped with a selection of oak style wall and base units with black marble effect surfaces and a one and a half bowl stainless steel sink unit with mixer tap. There is an integral Whirlpool electric oven, four ring gas hob and extractor hood over, plus plumbing for an automatic washing machine and space for a fridge freezer. Finished with cream décor, complimenting tiled splashbacks and ceramic tiled floor, the kitchen also has inset ceiling spotlights, selection of power points and a single radiator. A white colonial door leads to the hallway. The hallway is decorated in contemporary neutral shades with grey laminate flooring, and includes power points, two wall lights and loft storage access. Colonial doors lead to the master bedroom, second bedroom, bathroom and lounge. A set of white uPVC double glazed French doors, open to the conservatory with views of the private rear garden beyond. Decorated in shades of taupe and cream with white coving, ceiling and woodwork, the lounge is finished with contemporary grey laminate flooring. There is also a ceiling light, radiator, media connections and selection of power points. An open arch leads to a small hallway with the office beyond, and white colonial doors leading to the third bedroom and a storage room. Currently used as a dining room, the conservatory is of brick and uPVC construction with a complimenting pitched roof, allowing views of the rear garden on three sides. Finished with cream tiled flooring and power points. A set of patio doors open to the garden proper. A set of uPVC double glazed windows open onto the rear garden, lighting the third bedroom. Decorated in shades of cream with laminate flooring, there is also a ceiling light, power points and single radiator. A great office space or hobby room, lit with a uPVC double glazed window to the side elevation and finished in contemporary grey décor and laminate floor. There is also a ceiling light, radiator, and power points. A great size master bedroom, lit by a UPVC double glazed bow window to the front of the property. Decorated in neutral shades with complimenting skirting and cream carpet, the master bedroom benefits from a ceiling light, radiator, TV point, and selection of power points. Lit by a uPVC double glazed window to the side, and a velux window in the ceiling, the second bedroom is decorated in cream with complimenting carpet, ceiling light, radiator and power points. Lit by an obscure uPVC double glazed window to the side of the property, the bathroom is equipped with a low flush WC, hand wash basin and corner bath tub with mixer shower head over. There is also a radiator and ceiling spotlights. Decorated in shades of cream with sandstone effect tiled splashbacks and ceramic tiled floor. Private, peaceful and well maintained, this level garden is enclosed by timber boundaries and includes a selection of mature shrubs and trees, slate beds, lawn and paved patio area with a feature pergola over. There is also a storage shed, an outside tap and light. Set on a quiet no-through-road in the popular village of Westwood, the property is bordered by an orchard to the rear, with countryside walks accessible just a short walk away. This friendly community area along with its sister village Jacksdale, enjoys a number of local conveniences, schools and medical facilities, while being within easy reach of larger commuter routes such as M1 Junction 27, A610 and A38 for Alfreton, Mansfield, Nottingham and Derby. Property reference 20206. The information displayed about this property comprises a property advertisement. OnTheMarket.com makes no warranty as to the accuracy or completeness of the advertisement or any linked or associated information, and OnTheMarket.com has no control over the content. This property advertisement does not constitute property particulars. The information is provided and maintained by MCM Estates & Lettings - Jacksdale. Please contact the selling agent directly to obtain any information which may be available under the terms of The Energy Performance of Buildings (Certificates and Inspections) (England and Wales) Regulations 2007 or the Home Report if in relation to a residential property in Scotland.